When you learn how to make this broccoli salad recipe you will surely get rave reviews. My niece, Kristie shared it with me because I loved it every time she made it when I have been in Ohio. Her husband, Brandon always gets the job of cutting the broccoli. I credit the delicious flavor of the salad with the way he cuts the broccoli. Brandon sits and very meticulously cuts the broccoli head into very small pieces. (That is why he gets the job.) You may think my remark is strange but I do believe that it makes this salad more delicious than any other broccoli salad that I have eaten. The flavor of all the ingredients blends through Kristie’s salad better because it is cut so small. Thanks Kristie and Brandon for sharing your recipe. Brown bacon until crisp. Drain on paper towels and crumble. Mix together the mayonnaise, sugar, salt and vinegar; blend well. Combine cut broccoli, bacon, celery, onion and raisins in a large bowl. Pour in the mayonnaise mixture. Mix well. Cover and refrigerate. Flavor is better if refrigerated for a few hours. Wash thoroughly and dry broccoli; cut into small pieces. Mix mayonnaise with olive oil. Mix mayonnaise mixture and remaining ingredients with broccoli in a large bowl; toss to blend. Cover bowl and refrigerate for several hours for flavor to blend. Cut washed broccoli in small pieces; combine with raisins, peanuts and onion. Combine and mix mayonnaise, sugar and vinegar. Combine all ingredients together and toss to blend. To make dressing combine sugar, oil, vinegar, water and flavor packages; blend and set aside. Crush noodles into tiny pieces; mix with almonds and sunflower seeds. Combine and mix together broccoli and green onions. Combine almond mixture with vegetables; drizzle with dressing and toss to coat. Serve immediately; serves 8 to 10. Learn how to make this broccoli salad recipe for a light lunch in the hot summer. Soak raisins 5 minutes in hot water; drain. 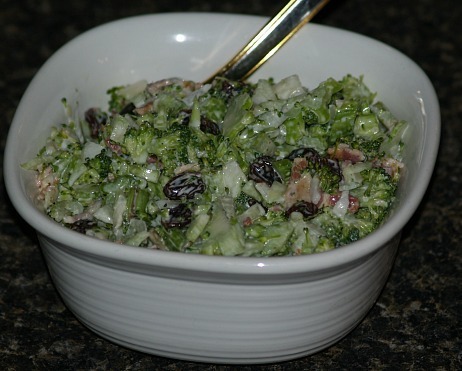 Combine raisins, broccoli, grapes and green onions in a large bowl. In another bowl combine mayonnaise and vinegar; stir into broccoli mixture. Cover bowl and chill; before serving stir in almonds and bacon.